Continuing our dealmaking series, we explore one of the initial stages—finding a suitable partner—and provide advice on attracting and selecting the right match for your company and products. A biopharma deal can bring scientific and financial resources, a way to share the risks of taking your products through development and ultimately a route to seeing that these products reach the intended market. In this feature, we provide advice on searching for the right partner, attracting them and finally discussing how you can position yourselves to be ready for a potential partner’s questions. There are thousands of biopharma companies globally, and finding the right match for your company or product can be a long process, with many suitable partners dropping out along the way. Any potential partners should have the same strategic vision for your program as you do, the right technical expertise, enough funding and the right people to drive your program forward. When assessing potential partners, it is important to look not only to the big players but also to the smaller companies, as they can often offer quicker decisions, be more willing to take risks when considering novel targets or mechanisms, may be more flexible on deal structure and might be more committed to your program than a big pharma company, given the smaller company’s need to focus more resources on fewer assets. And remember that potential partners, no matter the size or complexity, are institutions run by people, and one person can wield outsized influence (good or bad) over a decision to license your program. When starting out, it is good to search for companies active in your indication that have experience with your type of product. Industry databases or websites offer a quick start to obtain a list of companies that have overlapping interests. Biopharma events provide a key source of potential companies, which can be identified through partnering meetings, dedicated sessions or networking events. It is also good to explore existing connections you may already have between your board or key executives to similarly placed executives in similar companies. And of course, experienced business development professionals may have many contacts to tap. To attract partners, it is important to build awareness of your company and product, which can be achieved in several ways. Scientific presentations: a thorough scientific presentation at a conference or dealmaking event is an ideal way to concisely communicate the facts and goals of your company and product in a data-rich way. You can provide contact details for listeners to follow up on and often establish direct contacts in the audience. Website: ensure your website is up to date and clearly explains who you are, what you are working on and how to contact you. Attend conferences and partnering meetings: there are many global partnering meetings where you can set up dedicated meetings with companies you are interested in partnering with to personally tell people about your company and products. Personal contact is one of the most powerful methods of establishing credibility, and such meetings are also an opportunity to build relationships with potential partners. Create publications: if you have strong nonconfidential data to support your product or technology, submit a paper to a journal to see if you can get it published. Appearing in a reputable scientific journal will raise awareness and provide validation from the scientific community of interest. Being written about in a trade press overview, even with other companies, can also bring you to the attention of a potential partner. A public relations firm can help get these placements. Publish press releases: have you just signed a deal with an influential partner? Do you have some promising clinical trial results? This is worth broadcasting in a press release. Participate in panels, webcasts or webinars: panel discussions, webcasts or webinars (online presentations that people can tune into or listen again to after the broadcast) can provide an ideal platform to communicate about your company and answer questions that may be shared by potential partners. What unmet need does the product address? How does it compare to standard of care and other competitors in development? What evidence (in vitro and in vivo) do you have of its potential? What is the stage of development and completeness of data? Is it practical? For example, for a potential drug, what is known about its pharmacokinetics, stability and manufacturing? The path to market: what needs to be done and spent to get to market? And to gain market differentiation? What are the reimbursement considerations? The key tool for sharing your story and beginning to answer such questions is a nonconfidential slide deck you present to potential partners. Sharing a nonconfidential deck by emails and at partnering our information viewed by many partners, usually by a business development individual seeking opportunities that are a good strategic fit. There can be a tendency to assume the internal scientific review teams at in-licensing companies have the time to carefully review every aspect of presentations, but given the numbers of opportunities to review, it is critical that you offer a clear and concise representation of your story, so the reviewers will recognize it is worth spending time on. Clarity is key: decks are circulated, and the story must stand on its own without a narrator. Keep in mind that the audience may not all be experts in the area. Use slide titles as messages: this offers a summary at a glance as a reader flips through the deck. Address the ‘elephant in the room’ : provide a solution or a path to a solution to any obvious risk. Provide a summary: a few key points to remember. Put your contact details on the deck: they can often get separated from emails. A deal will need a key individual or team within the potential partner company who can work to support the importance of your product within their organization. Find that individual or team and keep them informed, getting them everything they need to tell your story for you, including in internal meetings that will happen without you as the partner builds the internal support necessary to get a deal. Once you are successfully through the nonconfidential review process (teleconferences, and exchange of questions and answers to questions such as those above), enough interest in your product will lead to a due diligence process—a comprehensive review of all data and plans available with an agreement to protect the confidentiality of the information, such as a nondisclosure agreement. Additional people will be involved on the partner’s side, and evaluation of the program will grow to include deeper assessment of all the topics in your nonconfidential story as well as how to value drug candidate(s), deal concepts and structures, and deal terms. The assessment of potential, the time and cost of development, and the risks together enable a valuation, typically based on calculations of risk-adjusted net present value. In this due diligence review, the potential partner will be thinking about the answers to a framework of risk assessment, evaluating the developability of your product candidate(s). Even at the pre-clinical stage, a good partnering package lays out the entire path- way to approval and market position, by providing insight on the questions highlighted in Table 1. It is very unlikely you will have all the answers, especially early on. However, data that begin to answer these questions, or planned experiments designed to get answers, demonstrate a rigorous approach to development that impresses potential pharma partners. Above all else, think about demonstrating efficacy. A lack of efficacy has been shown to be the main reason for failure, accounting for half of suspended phase 3 programs (Nat. Rev. Drug Discov. 15, 817–818; 2016). Evidence that your preclinical efficacy is likely to translate to human proof-of- concept is the most important driver for getting a deal. 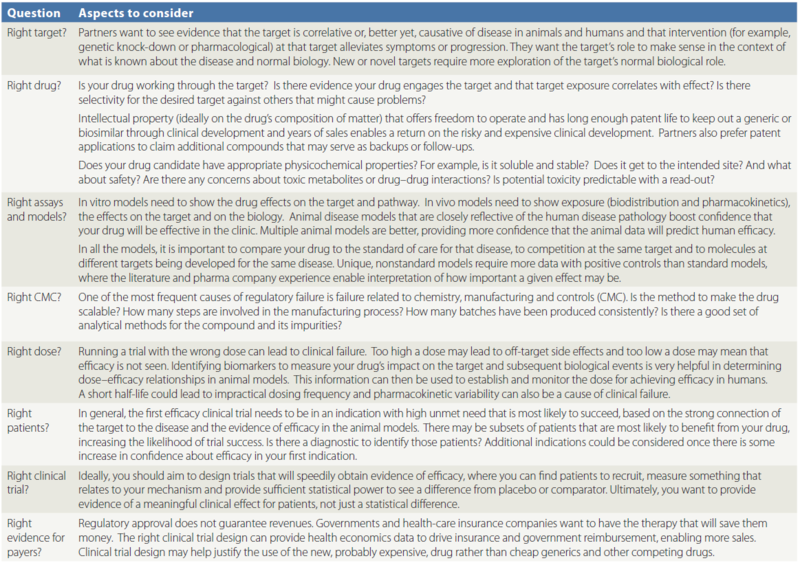 Then, laying out the entire pathway to showing that you have the right target, drug, assays, chemistry, manufacturing and controls (CMC), dose, patients, trials and evidence for payers will enable you to beat the competition and attract a partner. Linda Pullan and Trevor Thompson are at Pullan Consulting, which provides advice and execution for biotech partnering and fund raising.